The Florida State Seminoles play all of their home games at Doak Campbell Stadium, which has grown from 15,000 seats in 1953 to nearly 80,000 seats today. The name of the field itself honors head coach Bobby Bowden, who led the Seminoles to more than a dozen championship wins between 1976 and his retirement in 2009. Against that storied backdrop, Florida State University now has a powerful sound reinforcement system driven by 320,000 watts of Danley Sound Labs power. The system is also the first to feature two massive Danley J-5 Caleb loudspeakers, which have proven capable of delivering 113dB of clean, undistorted audio to the seating beyond the opposite end zone, along with additional Danley Jericho Horns, Synergy Horns, and BC subwoofers. The system is the first to feature two Danley J-5 Caleb loudspeakers, capable of delivering 113dB of undistorted audio to the seating beyond the opposite end zone, along with additional Danley Jericho Horns, Synergy Horns, and BC subwoofers. Larry Lucas, director of audio and broadcast engineering at AV consultant Anthony James Partners, created the new design for the system, which relies entirely on Danley’s point-source boxes. 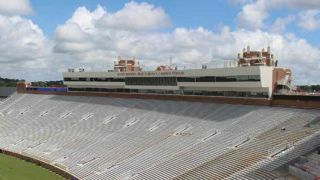 “Unlike most stadiums of its size, Doak Campbell Stadium has no balcony from which to hang a distributed system, or even to hang fill speakers,” said Kyle VanLandingham, project manager for All Pro Sound of Pensacola, FL, the integrator that installed the system.